Skip Critell is a history teacher/historian who brings Abraham Lincoln back to life. With years of knowledge of the Civil War and President Lincoln, Skip can provide education & entertainment for your school or event. Church, school, civic, commercial and many other groups can benefit from these presentations. Skip has participated with state capitols, museums, and multiple historical associations. Why hire a living historian? In an effort to make the Civil War more accessible for her students, Leslie Evans-Boxer turned to a Lincoln presenter. Evans-Boxer, 41, relocated to Idaho from Pennsylvania a few years ago to teach refugee and immigrant children at the Boise Language Academy. Living outside Gettysburg she's been exposed to Civil War re-enactments and felt that having a performer visit her class might be a good way to excite her students about Lincoln's legacy. An internet search for performers in the Boise area turned up Skip Critell. She was dazzled by his performance. "I opened the door to let him into the classrom and my jaw dropped," Evans-Boxer recalls. "He looked so much like Lincoln." Critell charmed the kids by passing around old artifacts from the era such as marbles and a slate board. He also showed photos of Lincoln's boyhood home and school books from the time. But the part of his performance that left the children floored was his recitation of the Gettysburg address from memory. "This just brought it to life in a fresh way," said Evans-Boxer. "I'm not sure they'll remember anything else from this year, except that lincoln came here." Contact Skip Critell if you're interested in a living historian at your next event. 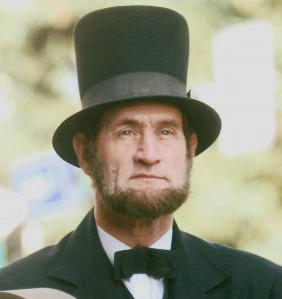 skip critell as abraham lincoln. A list of useful online resources. Watch - "Looking For Lincoln"
Quiz - "Lincoln Myths and Misconceptions"
A house divided against itself cannot stand. I believe this government cannot endure, permanently half slave and half free. I do not expect the Union to be dissolved -- I do not expect the house to fall -- but I do expect it will cease to be divided. It will become all one thing or all the other. I do the very best I can, I mean to keep going. If the end brings me out all right, then what is said against me won't matter. If I'm wrong, ten angels swearing I was right won't make a difference. © 2018 Lincoln Remembered. Website Design by Instabuild. All rights reserved. Credit for Photography/Prints of Lincoln belongs to the Library of Congress.